The the heavens rejoice! Blizzard has finally annouced that the latest chapter in the Diablo series, Diablo III, will be released on May 15th (Looks like I need to take some time off work). 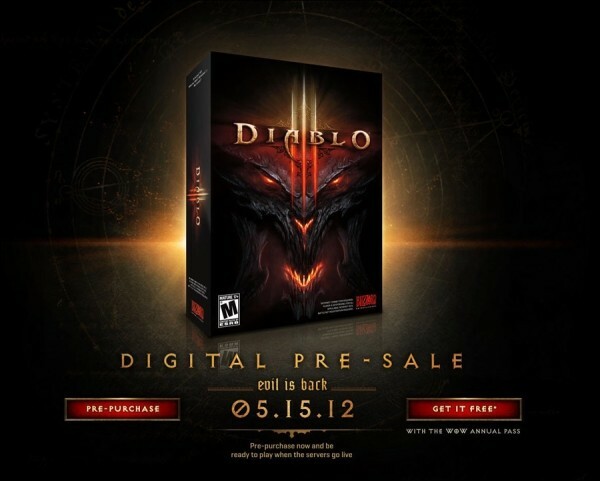 On top of that you can now pre-order Diablo III and download it, however you won’t be able to play it until May 15th. The upside to that is you won’t have to wait forver for it to download, the downside is you’ll have to suffer knowing you already have it on your PC but won’t be able to play it. World of Warcraft players interested in getting Diablo III for free can still get in on the World of Warcraft Annual Pass, but the promotion will be ending at 12:01 a.m. PDT on May 1, 2012. When you sign up for the Annual Pass and make a 1-year commitment to World of Warcraft, you’ll receive a free digital copy of Diablo III, an exclusive World of Warcraft in-game mount (Tyrael’s Charger), as well as access to the upcoming World of Warcraft: Mists of Pandaria beta test. Learn more at the Annual Pass signup page. For more details on the May 15 release of Diablo III, be sure to hit the official press release, or head to our new Diablo III game page to learn more about the game and pre-purchase your digital copy. *When you pre-purchase Diablo III, you will be able to download an encrypted version of the game that will be unlocked upon release on May 15. So what are you waiting for? Head on over to Battle.net and get downloading!